Functional training will keep you active and strong for years to come. You don't have to be an athlete to enjoy the benefits of functional workout routines. From climbing stairs to lifting a heavy laundry basket or mowing the lawn, functional workout routines can make everyday tasks easier. Functional workout routines focus on core stability and mimic the natural movement of your joints and muscles. If you have a chronic illness, such as diabetes or heart disease, or bone conditions including osteoporosis, see your doctor before starting a new workout routine. Some people blame weight gain or an inability to lose weight on a “slow” metabolism. When you eat and drink, your body changes food and beverages into energy. This process is your metabolism. Your body is constantly burning food or stored fat for energy, even when you are resting and sleeping. The more active you are, the more calories your body burns to produce energy. Exercise requires more energy, so your metabolism picks up the pace and burns food and fat to supply the energy you need. Reduce the number of calories you take in every day and exercise regularly to keep your metabolism humming along. The purpose of functional training is to improve the health and strength of your joints and muscles so that you function better. Some muscles in your body help you lift, push, walk and run. Other muscles stabilize your joints. A strong core helps to improve your posture, stabilizes your spine and increases your strength and endurance. Exercises that strengthen your abdominal muscles, your hip rotators and abductors, your shoulders and upper back improve your overall level of fitness and strength. Select exercises that mimic natural movements, such as walking, rotating your trunk, pushing, pulling, sitting and standing. You use more than one joint and muscle for most common daily activities. For example, you use your legs, upper back, arms and core muscles when lifting something heavy. Functional workouts include compound exercises that work more than one joint and several muscles at the same time. Doing lunges forward and to each side improves the strength and flexibility of the muscles and joints you use when doing chores such as raking leaves or vacuuming a carpet. Stepups while holding dumbbells simulate the movement of carrying something while climbing stairs. Squats combined with a biceps curl improves your ability to squat, lift something such as a laundry basket, and then stand up. A new type of functional fitness training is called ViPR, pronounced “viper.” It means Vitality, Performance and Reconditioning. ViPR functional fitness training employs a long length of pipe that you carry, drag, toss, roll and stand on to improve functional fitness. Just as you use a number of different joints and muscles in compound exercises, you will use your entire body when you do exercises such as lifting, tossing and squatting with ViPR. 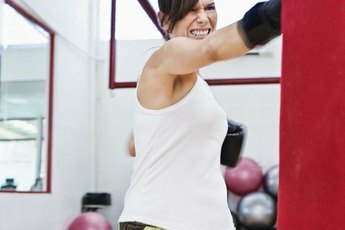 Human Kinetics: What Is Functional Training? 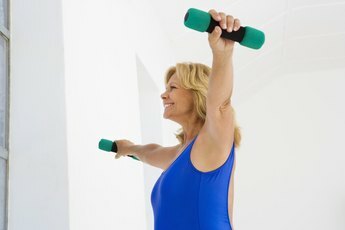 MayoClinic.com: Functional Fitness Training: Is It Right for You?